Installing vinyl flooring in your RV can be a great way to save on many levels. Find out below five of the ways we found it helpful and why we installed it in our RV ourselves almost immediately. The RV life often involves raw and dirty adventuring -- and sometimes kids. Oh yes, and some of those nasty RV only messes that can happen in the restroom...well, we won;t go all the way there. For all those unfortunate messes in your motorhome or camper, vinyl flooring makes cleanup so much easier. When we purchased our RV, we noticed the previous owners just painted straight over the sub-floor. Not a super huge deal. But that made it more vulnerable to going bad faster. So, we decided to cover it up with vinyl flooring almost immediately. This actually has helped create a waterproof barrier and keep the sub-floor sturdy much longer. This way, if our roof ever leaks or we have some nasty spill or accident, it's less likely to ruin the sub-floor. If you like the look of tiles, but want something more versatile and convenient, vinyl flooring may be the way to go. As you can see in the above pictures taken during our installation of the vinyl tiles, they completely change the look of the entire motorhome. Many tiles can be heavy and easy to break. This creates multiple problems in a rolling home. Vinyl flooring is lightweight and harder to crack. Even if you do somehow manage to mess up a spot, they are easier and cheaper to fill in. Imagine all the extra weight that would be added to your RV if you used traditional tiles. No thank you. I don't know about you, but ours has enough extra weight added as it is. And of course, one of the best reasons to install vinyl flooring is that it's super easy to do. 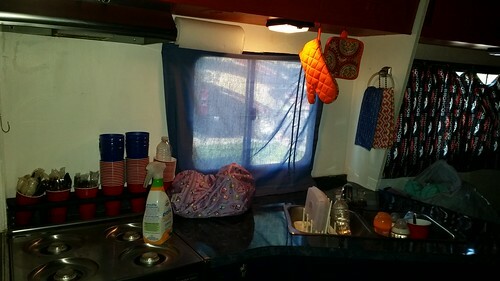 There are so many projects and repairs in an RV if you use it often. Vinyl flooring will allow you to do it yourself inexpensively and quickly without having to hire help and pay an extra cost.